National Mineral Development Corporation is going to recruit fresher candidates in India for Junior Manager, Assistant Manager Posts. So, those candidates who are willing to work with this organization they May apply for this post. Last Date of Apply 31-January-2018. Total numbers of vacancies are 163 Posts. Only those candidates are eligible who have passed Degree in Engineering in Electrical/ Instrumentation/Mechanical/Chemical OR A Degree in Engineering or Graduation with 2 years Post Graduate Degree/ Diploma in Sociology/Social Work/Labour Welfare/Personnel Management/IR or MBA with specialization in HR/Personnel Management & Industrial Relations from a recognized University/ Institute. 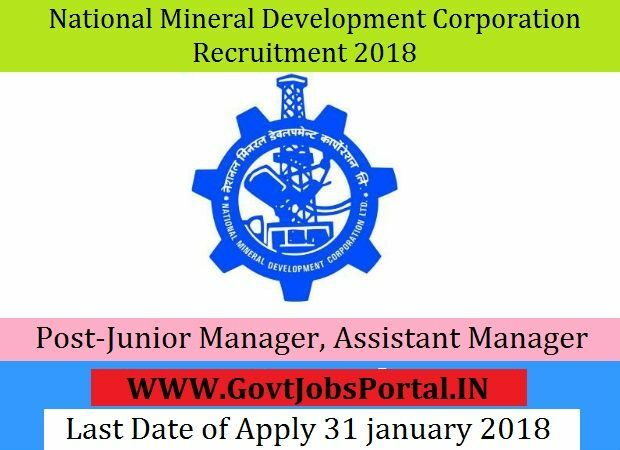 Indian citizen having age in between 18 to 34 years can apply for this National Mineral Development Corporation Recruitment 2018. Educational Criteria: Only those candidates are eligible who have passed Degree in Engineering in Electrical/ Instrumentation/Mechanical/Chemical OR A Degree in Engineering or Graduation with 2 years Post Graduate Degree/ Diploma in Sociology/Social Work/Labour Welfare/Personnel Management/IR or MBA with specialization in HR/Personnel Management & Industrial Relations from a recognized University/ Institute. What is the Process for Selection this NMDC job?